You Don't Wanna Know Jak! The phrase "You don't know jack"
"You Don't Wanna Know Jak!" is the thirty-sixth comic issue, which was released 26 March, 2008 in the US. Fry and Bender lean over a robotic parrot. Bender turns it on, and Professor Farnsworth says that they need to make a delivery of them to the planet of New England, which is a planet built by English robots who have rebelled against their masters. Another planet, New New England, has oceans of clam chowder. Eventually, a young robotic girl's memory is deleted next to the Planet Express Ship by Jak the Ripper. On Earth; Zoidberg, Hermes and Amy, sick of being left out of the crew's adventures, head off on their own into the Sewers, where the mutants find them and flush them into the sub-sewers. Bender is enjoying deep-fried malt liquor at a New England pub, and Fry is getting a tour of the Tower of New London. A guard shows Fry the place where Henry the Eight Terabytes had his six wives' heads cut off. But, they aren't dead, although Henry wishes they were. Leela is at New Buckingham Palace for the Changing of the Virus Protection. While she's there, another girl is deleted. 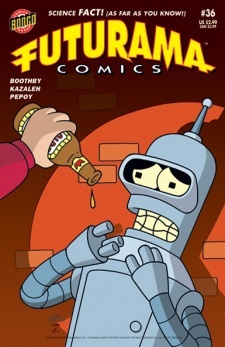 Bender vows to solve the mystery and "collect what I assume will be a huge reward". In the sub-sewers, the others are suprised to learn that the sub-mutants are perfectly normal looking and seem very willing and happy to help them out and welcome them to Perfectia. Bender snatches a book from the detective, it reveals Jak the Ripper's origins as a CD ripping robot. The detective snatches the book back and Bender learns that New English police don't carry guns, so he stops and robs a few stores. The Perfectians decide to make Hermes, Amy and Zoidberg their new leaders. Fry, Leela, and Bender witness another deletion and Leela mentions a clue. The robo-morgue workers take the body away. Leela notes another clue. Bender asks Fry to gather all of New England in one stadium. Bender's plan fails, and when a riot starts, Leela reveals that she knows who Jak the Ripper is. The other three learn that Perfectia is populated entirely by highly sarcastic snobs and leave sadly. On the other planet; another victim is deleted. Leela says that Jak is still there, and the morgue workers, under Leela's request wait to take the body to the robo-morgue. The body turns on and it is Jak, whose full name is Jakline. Apparently using disguises Jak backed up her memory, and then deleted it while in a disguise. A timer would go off, and Jak's memory would reboot, allowing her to escape from the robo-morgue. She got insurance money from Lloyds of New London who pay extra when you are the victim of a serial deleter. No matter how good you are, you have a risk of picking the wrong victim. By being perpetrator and victim, Jak controlled everything. Jak's next step was to open a Jak the Ripper theme park. Jak is arrested and the crew meet at the Planet Express building, where Bender has brought souvenirs, including two policeman. The policeman apologize as they beat Bender with their batons. Hermes refers to his mother with the commonwealth English "mum" in the US edition instead of the US spelling "mom", most likely to differentiate between his mother and Mom. The freakish race of sub-mutants mentioned in "I Second that Emotion" turn out to be descended from snobby surface dwellers who isolated themselves because they disliked everything about the surface. The society, Perfectia, is based on sarcasm. This would be the first comic story set in 3008, approximatley a month after The Beast With a Billion Backs. The title of this comic is an allusion to the PC video game series You Don't Know Jack. The male leads from the various series of CSI appear. Zoidberg's middle initial is identified as "D" despite having been revealed as "A" in the previously released Bender's Big Score. This is most likely a goof due to a poorly written "A" looking sort-of like a "D", the letterer or inker could then have misinterpreted it. This page was last edited on 4 May 2016, at 22:51.